The new Minister of Tourism for the Maldives, the Hon. 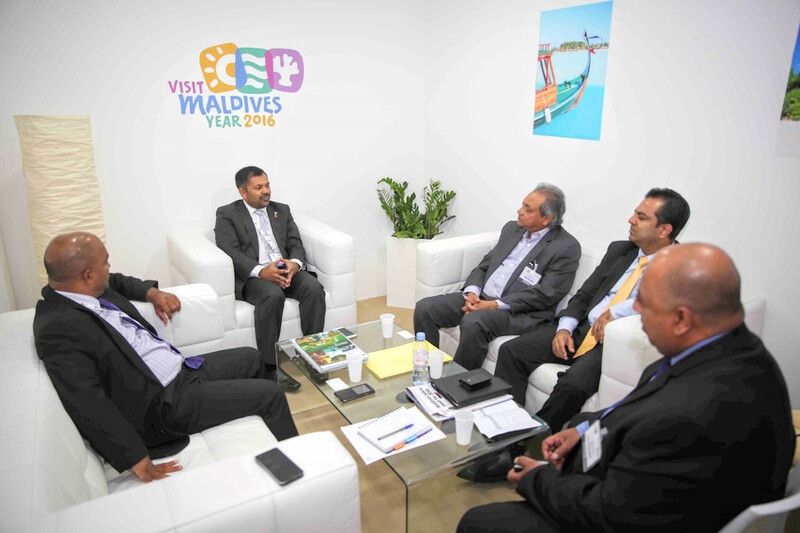 Moosa Zameer, met with the Chairman for SriLankan Airlines, Mr Ajith Dias, at World Travel Market 2015 to discuss further developing and improving the relationship between the destination and the airline during 2016, including an increase in connectivity from Europe to Malé. During the meeting, both parties also discussed the cost of flights from Colombo to Malé and providing a more cost-effective fare during 2016 making it even easier and more affordable to travel between the Maldives and Sri Lanka. SriLankan Airlines currently operates direct, daily flights from London Heathrow to Colombo with immediate connectivity to Malé taking approximately one hour and has introduced a new A330-300 fleet with the arrival of its fifth Airbus 330-300 on 10 November 2015 and a further two aircraft to be introduced before the end of the year. The Minister of Tourism, Hon. Mr Moosa Zameer, was appointed to the position on Wednesday 28th October 2015 and this marks his first visit to World Travel Market 2015.